Sure it is snooty, snobby, pretentious, and whatever other superlative you feel like throwing at it, but at least once, I would like to fly in first class on an international flight. As an airline employee, I can standby for flights for free or for a drastically reduced rate, but with a one-year-old in tow, our family is relegated to coach on international flights. Even in the beginning of air travel, luxury was key. 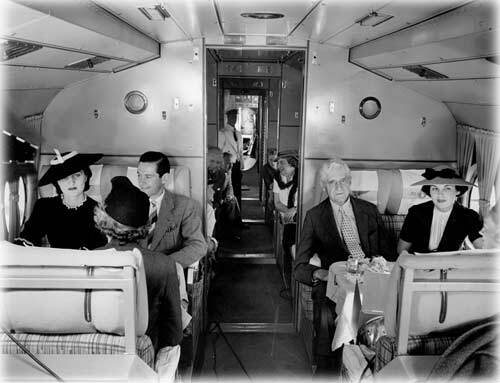 The influence of Pullman-style train travel could be seen in the parlor-like outfitting of early passenger aircraft cabins, and style and comfort were touted even as technology lagged behind and passengers were subject to slow, cold, and noisy flights. Even as the industry grew in the second half of the twentieth century, and speed started to become emphasized over comfort, flying remained out of reach of the masses, and the service and surely the cost reflected it. A co-worker of mine described his early days in the airline industry as “before damned de-regulation ruined everything. You wore a suit and tie, not just because you were an employee, but everybody dressed up. And if someone was in first class, it was because they were somebody. 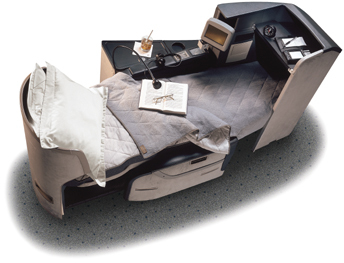 Now everyone with a frequent flier card gets a free upgrade.” Though it would have been nice to get on any flight you wanted (full flights were almost unheard of in 1978), and to always get first class, it was still before the days of personal mini-suites with lie-flat seats. And it was before meals were planned by world-renowned gourmet chefs and prepared with magical machinery. 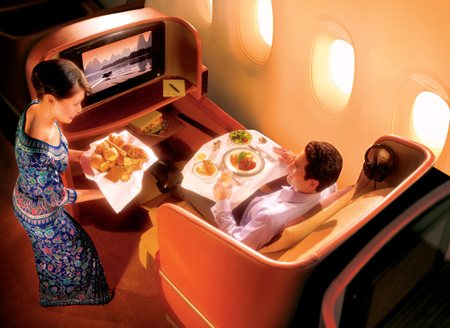 Nearly every person I know that has flown in first has sworn the food was better than any they had ever had, and these weren’t strangers to fine dining. How does the highest caliber of gourmet food come from the sterile and unimaginative galleys of aircraft? Forgetting the food, the supposed prestige, the entertainment choices, the free booze, and the doting attention of the flight attendants, I really just want to be able to sleep. 6’2” in coach? Twenty years of yoga and a course in contortionism wouldn’t help me sleep in an airplane seat. But a lie flat seat? Heaven.